Hello! I hope you have enjoyed the Issie top pattern tour so far. Today is the beginning of a new week with many more talented ladies sharing their makes. Remember, until the end of the tour you can receive 10% off the purchase price of the Issie top by using code: ISSIERELEASE10. Don't forget you can also now purchase the pattern in Dutch and now also French!! Thank you so much Ariane for the French translation!! Today three more lovely ladies are sharing their Issie tops! Today I am excited to introduce you to four wonderful sewers who are sharing their makes. Today I am very happy to introduce Mijke and Fabienne - two super talented sewers and lovely ladies! Mijke lives in the Netherlands with her husband and two children - Rose and Hugo. She began the lovely Instagram account, Ridders en rozen just a few months ago and she sews the loveliest things. Mijke designed the Rose collar that features in the Issie top pattern and I have gotten to know her better over the past couple of months. 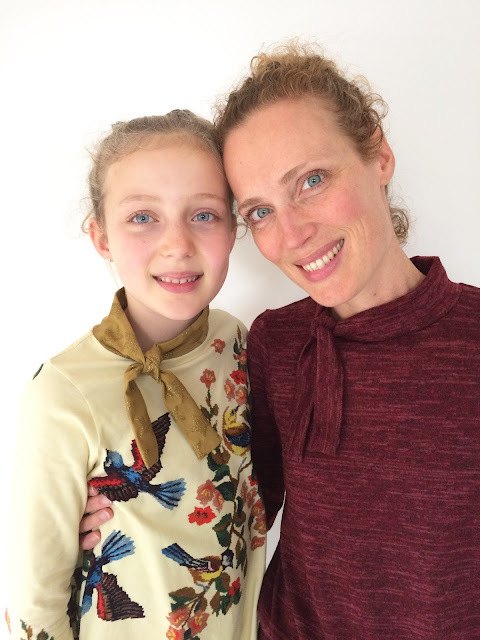 Mijke is a beautiful person inside and out and I am thrilled to share her two Issie tops here. She made one for Rose and one for herself!!! Aren't they amazing?! Make sure to check out her account as she share another modified Issie top she made for herself yesterday! Head over to Mijke's account to see more photos! Fabienne lives in Belgium with her husband and four children - two girls and two boys, and they are all adorable! She blogs and IGs at 128 or hondertachtentwintig (Dutch for 128). She loves to sew for them and has wonderful style. Fabienne helped me with testing and has been on a few of my blog tours recently and I am always excited to have her on board because everything she makes is awesome! Just look at her two adorable daughters in their pretty outfits!! Head over to Fabienne's blog to see more photos. Thank you so much Mijke and Fabienne! It was lovely to have you! Come back Wednesday for more Issie fun!